I am delighted to tell you about a *new* feature coming soon (like tomorrow) to my "God is Love" blog-- true love stories! Starting tomorrow (Feb. 1, 2015...Eastern Standard Time because yes I know it's already tomorrow in Australia), real-life married couples will share their journey with you of how God brought their significant other into their lives and orchestrated their true love story! Now these special guest posts are not limited to only married couples, single people are welcome too because I believe that before you can meet and marry the person of your dreams, you need to first be a complete person in your relationship with God. So my single guests who are not yet engaged or married will share the story of their true love relationship with Jesus Christ and the peace it gives them as they wait for their true love who God made for them to marry. But that's not all, there's a book review and author interview in the works! Author Gina Welborn wrote the book, Masterpiece Marriage for the Quilts of Love book series and my review of her book will go LIVE on my blog tomorrow morning, Feb. 1. Gina will also be our special guest on Sunday, Feb. 8 when she will be featured on my blog by means of an author interview. So please stop by two weeks from now to learn about Gina as an author of Christian romance, a woman of faith and former script writer for a news station. Yes, she's one multi-talented lady and I believe you will be inspired by her faith journey and God-given career. But honestly, you will want to visit my blog every day next month because it's going to be a wonderful experience for young adults and the elderly too! So here's to embracing the sweetness and wonder of Valentine's Day, for the entire month of February through the celebration and sharing of true love stories about real people who believe in the God who not only created them but created their soul mate and orchestrated their love story in a way that's second to none! The song above says it ALL. I could end this blog post right here, right? But I won't because it's Thursday and I'm thankful for the fact that God KNOWS. He knows it ALL and not in a puffed up persona. No, God knows it all because He created this world and everything and everyone in it. Beyond that, He created and rules the entire universe. Newsflash: there are other worlds beside this one and I don't just mean the planets in our solar system. So why not trust Him with every single detail of your life? Why not wait on God for that best friend, that significant other, that dream job, that quiet hope in your heart that only...yes you guessed it, GOD KNOWS. My favorite way that God speaks to me is by dropping songs into my spirit. I know He speaks to me this way because when I am discouraged or hurting, a certain Contemporary Christian or Gospel song will start playing in my mind. Sometimes it's just the first few lines/lyrics or the chorus. But ALL the time, it is exactly what I need to hear and I become calm and focused. God totally readjusts my attitude and outlook on life when He breathes life into whatever situation seems hopeless, through the music ministry of my favorite Christian musicians. God gives us the breath of life. No, it's not your alarm clock that wakes you every morning, it's Your Creator God who allows you to see another day. God loves you will all His divine heart. He wants what's best for you. So again, why not go to Him with all of your concerns, questions, fears, hopes and dreams? Because remember, He knows. "If God already knows what I want," you may be thinking right now. "Then why ask?" Finally, a thought to remember: When you feel like no one understands you because they have not been through what you've endured and don't know how to help, go to God because...that's right, He knows! Not only does God understand you, His Son Jesus Christ has been through everything you're going through and more. Best of all, God's not going anywhere. He's here for you and He knows exactly what you need. P.S._ Read Psalm 139 for Bible-based insight into why God knows everything about you. Who thought true love was worth taking a "calculated risk"? The main characters in Zoe M. McCarthy's book Calculated Risk, sure do! :) But the journey of how they realize it's worth a shot is not completed in one day or in this case, one chapter of this Christian fiction book. The journey to finding true love takes time and there are twists and turns in the process, all of which Zoe writes wonderfully well. Alexis: Your leading lady in your book Calculated Risk is named Cisney. What a unique name! Why did you choose that name? Does it hold special meaning? Please explain. Zoe: I chose the name Cisney because it was my maternal grandmother’s middle name. I’ve always liked the name and wanted to honor my grandmother. Cisney is an independent career woman who in the first few pages, is still trying to get over the man her father wanted her to marry. Why did that man dump Cisney? Will she find true love? Or will she never take that “calculated risk”? I’ve met people who are competent and independent in one setting, such as the workplace, but play a more submissive role in their home life. I’m reminded of the boss, Miranda Priestly, in the movie, The Devil Wears Prada. Cisney wants to please her father. Jason, the dumper, is much like her overbearing father. She tries to be the kind of woman Jason wants, but it’s just not who she is. Later in the story, Cisney asks Jason the question you posed, Alexis, and she wishes she’d left his reasons to her imagination. As to, will she find true love? Guaranteed. The genre is contemporary romance, after all. Your leading man is Nick. What role does he play in Cisney’s life? In the beginning, he’s the actuary who evaluates Cisney’s marketing ideas to make sure they aren’t financially risky for their insurance company. So, she has to sell her ideas to him and hope he blesses them. In a compassionate moment after he’s present during Jason’s dump-Cisney phone call, he invites her to spend the Thanksgiving weekend with his family. The fun begins and her role starts to change when these two extreme opposite colleagues have to get along during a five-hour drive and a few days together. Cisney experiences many “mini” crises in this story but perhaps the most serious one was her dad’s heart attack. Explain why you included that in your story. What role does that detail play in the purposes of your storytelling? I love the romantic ending to your story! Tell my readers about your plotting process. Did this story end the way you originally planned? Or did you characters sort of “surprise” you as you wrote the story? I’m glad you enjoyed the ending, Alexis. I plot the major events, the disasters and the black moment in my stories. But after developing a good sense of my characters, I allow them to get to those moments and handle them their way. So yes, they often surprise me. What their personalities come up with is so much better than what I might drop into their lives. Do you have a special place where you go to write your stories? If so, please describe what it looks like and what it means to you. We built a house on a hill in Southwestern Virginia during the writing of Calculated Risk. Because I planned, and do, treat writing as a nine-to-six job, I knew I’d be spending a lot of time in my office. So as we designed the house, I put much thought into my office. It’s long with wall-to-wall windows that look out on to the mountains and down on Christmas tree fields and farms. I have a gas fireplace at one end to keep me toasty. Two walls are lined with floor to almost ceiling bookcases packed with biographies and novels of all genres, Bibles and Christian studies, and books on the craft of writing. I have a wonderful cherry desk with a big desktop Mac, but I prefer to write on my MacBook Air in my recliner. I always enjoy climbing the stairs to my room to spend time with God and write. Are you traditionally published or did you go indie? Do you have an agent? Please share the story of your publishing journey. I’m traditionally published with White Rose an imprint of Pelican Book Group. When I was eight, I wrote a one-paragraph cowboy story. I’ve been gifted in story ideas and the desire to write them, but I had to learn the craft of writing. Over the years, I stuffed many uncompleted manuscripts under my bed. When my boys were small, I escaped to writing and submitted a completed manuscript to a publisher. Although it was rejected, the time I spent on editing grammar gave me a good base in that area. As a new Christian, to explain difficult Bible passages and teachings to myself, I wrote short stories. I learned to write concisely. I self-published two books of these contemporary short stories. In performing every publishing task myself, I learned much about publishing. At a writers’ conference, I signed with literary agent Joyce Hart of Hartline Literary Agency. I joined American Christian Fiction Writers (ACFW), which lead to critique groups, writer email loops and conferences. Christian Fiction Online Magazine published two short stories, one from my self-published books and one later after I found my writer’s voice. I completed four manuscripts. Each rejection was better than the prior one, giving me more helpful feedback and invitations to submit other projects. In a workshop, agent Chip MacGregor said it takes four completed manuscripts to learn to write and usually the fifth gets published. When I heard that, I was working on my fifth book, Calculated Risk! Is Calculated Risk your first book? If yes, share the story of why you wrote it. Calculated Risk is my debut novel. My husband and I are retired actuaries. We evaluated insurance companies’ financial risks. I wanted to introduce a numbers man from this little known profession as the hero. And the heroine had to be his extreme opposite. Having worked with social, expressive marketing reps, I knew Cisney would be such a woman. A romance between Cisney and Nick was highly improbable. At least at first, because I always hammer this truth: opposites distract before they attract! What was the most challenging part of writing Calculated Risk? What was most difficult was letting my writer’s voice come through and allow the characters to be themselves. During the writing of Calculated Risk, I wrote a short story romance, “The Hitchhiker,” which my publisher will release free in an upcoming month. Because I wasn’t writing the story to publish, I had fun expressing the way I wanted to say things. I got inside those characters and let them run. I realized I’d just found my writers voice. Writing Calculated Risk turned into a fun romp. What is the most rewarding feature of being a published author? For me, it’s seeing how God orchestrated every task and learning experience in its proper time to eventually bear fruit in a published piece, whether it is for a few or many readers. Who is your favorite author and which one of their books do you love the most? Among my favorites, is Jenny B. Jones. It’s a toss up, but I laughed through Just Between You and Me. I aspire to Jenny’s writing. I enjoyed fifteen minutes with her in a mentor appointment at an ACFW conference. How does your faith in God play into your writing? Or does it? Before I became a Christian, I worked on a steamy romance. After I became a Christian, I rewrote the story into an inspirational romance. It was the first of my four rejected books. I saw that God had given me the passion to write, and I committed to write the stories he lays on my heart. He used each of those rejected novels to grow my writing. Are you working on your next book? If yes, please give my readers a glimpse into the story. My agent is shopping another contemporary romance with extreme opposite golf caddies. A tall young male caddy standing on a golf course green next to a tiny female caddy inspired this story. She had a long blond ponytail extending from the hole in her pink golf cap. I’m writing another story between extreme opposites. The heroine is a reserved accountant whose husband has recently died, and the hero is her laid-back golf pro brother-in-law. Treat rejections and critique-partner and contest-judge feedback as the best teachers to grow their writing. And to keep writing and submitting completed manuscripts until that “fifth” one earns a contract. Complete this sentence: At the end of the day, I am_________________ because ___________________________. At the end of the day, I am ready to spend time with my husband because I’m attracted to my opposite and he’s taken over the laundry, grocery shopping, and vacuuming so I can write full-time. Thanks for the interview, Zoe! Zoe M. McCarthy believes the little known fact that opposites distract. Thus, she spins Christian contemporary romances entangling extreme opposites. Her tagline is: Distraction to Attraction, Magnetic Romances Between Opposites. 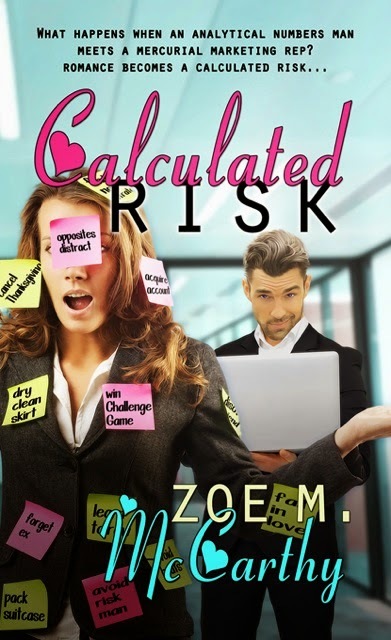 Calculated Risk is Zoe’s debut novel. Christian Fiction Online Magazine published two of her short stories. 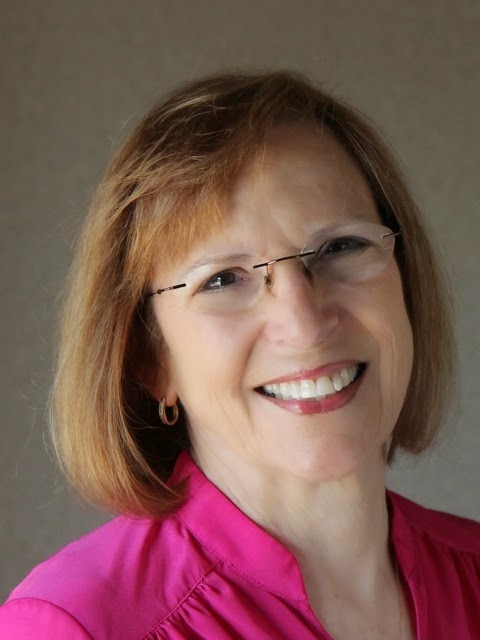 Zoe enjoys leading workshops on the craft of writing, speaking about her faith, planning fun events for her 5 grandchildren, and exploring the Blue Ridge Mountains, where she lives with her husband, John. Today I am hosting a talented author who works a day job as a school librarian! Laura Jackson is her name and I hope you will enjoy getting to know her on my blog today. But first, here's a gift just for you: Laura has agreed to give away one paperback copy of her book to a U.S. resident and one e-book if you're international (live outside of the United States of America)! You can enter the book giveaway contest by leaving a comment that answers Laura's question at the end of this interview. You need to include your e-mail address in your comment so that if you're the winner, Laura can contact you to arrange the deliver of your prize. The contest starts today, Jan. 11 and ends on Sunday, Jan. 25. The winners will be announced in the comment section of this blog post on Monday, Jan. 26. The winner will be selected via an old-fashioned random drawing conducted by me (Alexis). Alexis: Your second Young Adult (YA) novel, Worth the Time, released last Thursday. Tell us about it. Laura: Routinely ignored by her single mother, high school senior Lindsey Hamilton hides her loneliness behind a mask of flirtatious self-confidence that has many boys wrapped around her finger. However, during community service required for graduation, she meets a shy guy with a haunted past who barely gives her the time of day. Why doesn't he like her? Then the father she thought had abandoned her before birth wants to meet, and she discovers everything she believed about him is a lie. How will Lindsey learn to trust so she can realize that she has been loved all along? Who is your leading lady and main man for your book Worth the Time? Give us a glimpse into their character and history. Lindsey is the mean girl from book one in the Waltham Academy series, and I wanted to know why she was so hateful. I always root for the underdog, but I didn’t expect to love her as much as I do. I have a soft spot for the abandoned girl who is so desperate to be loved. Sutton is a guy Lindsey meets when she has to finish some community service hours. He’s had a hard life, but he loves Jesus. The book features them, but the most important relationship in the book is the one between Lindsey and her Creator. Share an anecdote that shows how you fell in love with YA books. I love the realness and open honesty of YA books, I love seeing characters figure out who they are. Once, I was reading Sold by Patricia McCormick during our silent reading time. It was quiet in the room, and I screamed out, “SAY YOUR NAME! JUST SAY YOUR NAME!” My kids all jumped, and I of course had to share a little about the book. Couldn’t keep it on the shelves after that. Do you miss your first career where you taught 7th grade language arts for eight years? Why or why not? I do sometimes, but I really love being a librarian. I see grades 1-5 every day for an hour, and we have so much fun. We read books and do crafts and play games in response to the book. However, I do miss the older kids, the great discussions you can have, the relationships you build when you have the same kids every day and are responsible for their education. Do you still work for the school system? Why or why not? Yes, I’m the librarian at an elementary school in a suburb of Houston. I love sharing my love of reading with over 700 kids every year. Is writing your full-time job now? Why or why not? I sometimes wish I could write full time, but I think the experiences I have through my job inspire my writing. Working at a school also gives me plenty of vacation time in which I can write. So, it’s a win-win. Who is your favorite YA author? Why? Ally Carter is fantastic. Every single one of her books is tightly written with amazing characters and a fast-paced plot. She’s amazing. Check her out. It’s not Christian fiction, but it’s very clean. What’s your favorite YA book ever? Why? Sold by Patricia McCormick moved me like no other book has. There You’ll Find Me by Jenny B. Jones inspired me to begin writing Christian YA. I write in my bed, surrounded by pillows. One day, I’ll have an office, but for now, I’m comfy. What do you love about writing the most? I’m not good at talking about my feelings, and it’s nice to get them all out through characters. What is your least favorite part about being a writer? Editing it. I enjoyed editing my books the first time, but by the fifth or sixth time, I’m so tired of the characters, plot, etc., I just want to throw it away. As a woman of faith, what role does your belief in God play into your storytelling? I love Coming of Age books, and even the best ones often miss the point—we find who we are in Jesus. And it’s that belief that pushes me to write about girls finding their worth, their way, and their identity in the One who made them. If you could be one of your characters in real life, who would you choose? Why? I’d want to be Ellie because I love Josh. It’s a New Year! What are your greatest goals for your writing career in 2015? To be more consistent in my writing. I want to finish two full novels and a novella. Complete this sentence: My favorite Bible verse is ________________ because _______________________. My favorite Bible verse is Philippians 4:11b in ESV, "I have learned in whatever situation I am to be content” because I feel that’s where God has me—learning to be content no matter where God has me. Alexis: Thanks for the interview, Laura! Please leave a question for my readers to answer so they can qualify for your book giveaway. Laura: Why do you like Young Adult (YA) books? Laura Jackson loves books—reading and writing them. 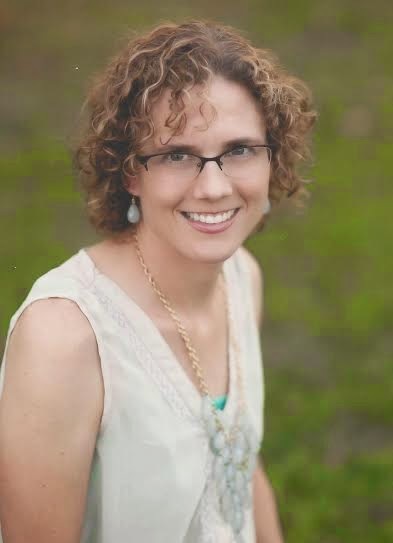 A life-long reader, Laura studied English in college and taught 7th grade language arts before earning her Master's degree and becoming a school librarian. Now, she spends her days sharing great books with kids and her evenings writing books about teenage girls discovering God and His plan for their lives. 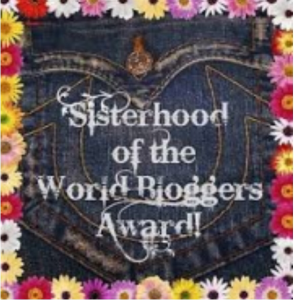 Today, I've been invited to participate in the Sisterhood of the World Bloggers adventure! Thank you for the nomination, Emilie Anne Hendryx! 2. Put up the award. 3. Answer the questions you have been sent. 4. Make up ten new questions for nominees to answer. 1. Share a favorite memory from 2014. God blessed me with my first radio interview in Spring 2014! I was interviewed on WGTS 91.9 FM, a family-friendly radio station based in Takoma Park, Md. Listen to it here. Claude Jennings, a DJ for WGTS, interviewed me about my first book, Hope in My Heart: A Collection of Heartwarming Stories, which was released in Sept. 2013. It was a special experience for me not only because it was my first radio interview but because I used to work for WGTS as an intern when I was a college student. I worked with Becky and Brennan on the Morning Show as their programming assistant. The job required me to awake super early to be there every morning because that show always airs live, but it was worth it! A very fun and delightful experience for which to this day I am grateful. So to have my career path go full-circle with God sending me back to where I used to work not to book an interview for the radio show like I used to do as an intern, but to be interviewed on the Breakaway program show was something special. 2. Are you doing a reading challenge for 2015? If so, what's the first book you're reading this year? No, I'm not doing a reading challenge for 2015 but I do have a stack of books I received from my favorite authors for free in exchange for an honest review. So I've got my work cut out for me this year, but I'm looking forward to it! The first book that I've decided to read this year is When Dawn Breaks by Jennifer Slattery. 3. What are three things you are looking forward to in 2015? Three things I am looking forward to in 2015 are: meeting my fitness goals, completing the manuscript for my next book and hopefully being able to purchase my dream camera, the Canon 5D Mark III DSLR (but if I get it as a gift, that would be even more wonderful)! I'd love to launch my own wedding and portrait photography business after I get the proper equipment such as the main tool, my DSLR. 4. If you could take a dream vacation where cost is not a problem, where would you go and why? London because my aunt lives there, it's a beautiful place and I want to check out The Goring Hotel. Since my last name (Goring) is spelled the exact same way with the same country of origin, I'm wondering if we're related. 5. What is one piece of advice (or realization) you received in 2014 that you'll carry with you? Trust God's heart even when you cannot trace His hand. I realized that no matter what unspeakable things I have to endure and go through, things that cause me to wonder if God's forgotten about me or I wonder where He is in dark times, I must remember to as the song by Babbie Mason says, "Trust His Heart." When I do not understand and I cannot trace God's hand, I can trust His heart. Relief is found in the fact that no matter what happens in this life, God is and always will be in control and He is always working things together for the good of those who love Him (Romans 8:28). 6. Share two of your favorite books from 2014 and a little bit about why you loved them. Kept which is the debut novel released in Autumn 2014 by Sally Bradley who happens to be the lady who edited my first book. I loved Kept because it was a real look at struggles women who have been brokenhearted by the hard knocks of life face. The main character Miska, was memorable and watching her transform from a "kept" woman who was having an affair with a famous baseball player to a Christian woman whose faith in God directed her life, led her to turn away from worldly ways and brought a true man of God into her life, was wonderful to watch. The characters were captivating and the story line was smooth and filled with scenes that made you identify with the characters and want what's best for Miska and the single pastor who fell in love with her unexpectedly. It was a sweet love story centered around themes of redemption and God's grace. I'd recommend it for every man and woman to read. Love Finds You on Christmas Morning, written by Debby Mayne and Trish Perry was a delightful holiday story which I simply adored. I especially loved the way Debby told her story, "Deck the Halls,"which was featured first in the book. It was very memorable and I loved the way Debby brought two main characters from two different backgrounds and economic statuses and merged their stories with the power of love. A very good way to show that love conquers all. It helps that I'm a hopeful romantic and stories like these play right into my heart. 7. Do you have a goal or resolution for 2015 you'd be willing to share? I'd love to get a literary agent, a true God-send who is the perfect match to represent my work and take me to the next level in my creative writing career. 8. Share a verse or word that you will be carrying with you into this new year. Trust. I know I need to trust God's plan for my life and take a step of faith even when I cannot see the whole staircase (as the great Dr. Martin Luther King, Jr. said). 9. What is one activity or place you hope to experience in 2015? I'd love to visit California and experience the beauty of San Francisco, Napa Valley along with visiting the heart of the film industry in Los Angeles. I want to dine at the best vegan and vegetarian restaurants, enjoy the perfect weather and inhale the ocean scented air. 10. Share with us something you are passionate about and how God has used that in your life thus far. I am passionate about people. I love showing God's love, compassionate character and heart of gold through my writings and findings which I share here on my blog "God is Love." I want every soul to come to know the freedom that comes in knowing Jesus Christ and accepting His gift of salvation. The best thing about it is you can't earn your salvation, it's a gift and it's free! All Jesus wants you to do is to accept Him into your life and accept the gift. When you accept Jesus into your heart, He will change you from the inside out. I know this to be true because it happened to me when I was 16. But that's another story for another day! However, I will say that since I accepted Jesus Christ into my heart, He saved me from what could have been a tragic end, transformed me from from the inside out and since then, I've been passionate about sharing the gospel of Jesus Christ with every person I meet. 1. What was your favorite memory from 2014? 2. What is your greatest dream for 2015? 3. What is your favorite color? Explain why. 4. Who are your favorite bloggers? Name at least five and share a link to each blog. 5. Who inspires you the most in life? Why? 6. Do you have a Starbucks habit? If yes, share details of your fix, including how often you buy it. 7. As a writer, what is your favorite bookstore? Describe what makes it special to you. 8. What is your favorite mall? Why? 9. What is one verse found in The Holy Bible that you've claimed as your "life verse"? 10. What is your one "word" for 2015? Explain why and tell how it will help you this year. Thanks so much my dear nominees for participating in this blog hop and thank you my wonderful readers for taking time to enjoy this entire blog post! :) Happy New Year! Today, we're welcoming a familiar face to my blog! 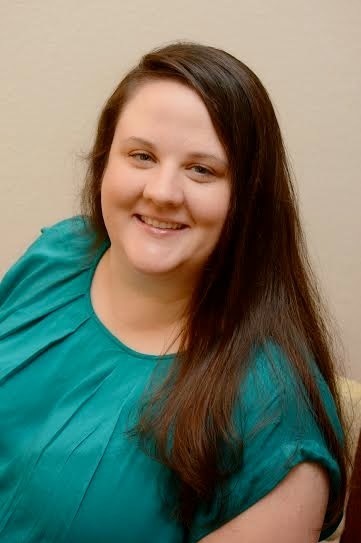 Jennifer Slatterly, an author who writes "missional romance" novels, first appeared here on Sept. 21, 2014 to talk about her debut novel, Beyond I Do. 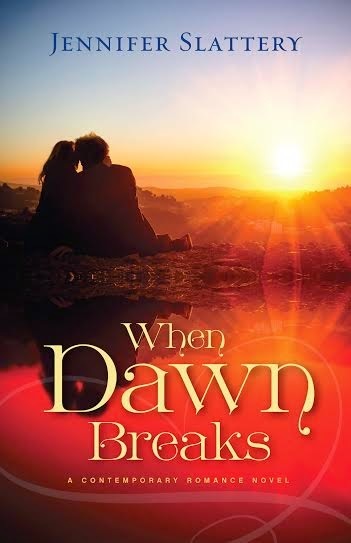 Jennifer released her latest novel, When Dawn Breaks, on Dec. 17, 2014 and asked to visit with us again to talk about it. So without further ado, here's my *new* author interview with Jennifer Slatterly! Please note: Questions by Alexis in bold, answers from Jennifer not in bold. Alexis: Welcome back to my "God is Love" blog, Jennifer! Jennifer: Hi Alexis! Thanks so much for letting me visit with your readers again! Congratulations on your new novel, When Dawn Breaks! Share a glimpse into what it took to make this book a reality. Do you mean from first idea to print? That was a long process! I’m a plotter, so I normally plan almost every scene out before I write, and then do a chunk of research. Then I tackle the first draft, which normally comes quickly. After that, I send it through numerous critique partners who usually annihilate it, and then I begin revising then I send it back to a few critique partners, then off to a beta reader. Then I sent it to my editor (the managing editor) who sent it to early readers who gave suggestions. Then it went to through big picture edits, and I was given more suggestions. After I made the necessary changes, it went through more edits, and finally, went to print. Describe the concept behind your title When Dawn Breaks. Does this book title carry special meaning for you? Why or why not? It’s funny, sometimes as I’m writing certain titles jump out and stick with me. That was certainly the case with When Dawn Breaks. This is a play on dawn breaking after a storm or dark night. The novel begins with a hurricane that, though devastating initially, ultimately becomes the catalyst for beautiful life change. I really believe this is true for the Christian life. God doesn’t allow us to weather a storm unless He has an amazing, grace-filled purpose in it. You drop the reader into the action at the start of the story where inclement weather is descending upon the town in Texas where your main character lives, causing evacuation. Was this your original plan? Or did you delete a previous scene? It works! Tell us why. Yes, this was my original intent, though initially I started a tad earlier in the day with Jacqueline, a real estate agent, at an open house no one came to. (I wanted to show the futility she was beginning to feel with her old way of life.) Then I had her walking outside, seeing the beautiful beach with the storm on the horizon. But my critique partners encouraged me to cut some of the details and start closer to the action. As always, they were right on! The setting came from my time living in Texas and Louisiana. We lived in Louisiana when Katrina hit, and the church we attended was heavily involved in relief efforts. I saw first hand the brokenness people suffered after the storm, how hard it was for many parents just to keep stepping, let alone care for their children. And yet, I also saw a miraculous (truly) outpouring of God’s love and grace. And in that I saw hope. Beauty. I wanted to retell a bit of the wonderful grace I saw displayed by God’s people. Tell us about your main character, Jacqueline Dunn. What inspired you to create this character? What are her passions and flaws? I’ve felt a passion lately for older, (relatively, compared to the age of most heroines in the CBA) single adults, those who’ve been divorced and came to grace a bit later, after they’ve made mistakes. This was my vision for Jacqueline. She’s spent 51 years living for herself, and this has created a wedge between her and her adult daughter. A wedge she longs, with Christ’s help, to break. I felt like this is reality for many families, even those in the faith. And I think it can be a challenging road to navigate. How does grace and truth fit when we’re in the midst of dysfunction? How does forgiving oneself and accepting the depth of grace affect this process? There’s no easy answer except: lean on Christ, do what we can to live at peace with others (Rom. 1:16), and leave the rest to God. That doesn’t guarantee relational healing, but it does mean, regardless the outcome, we’ve done all we knew to do. And there’s peace and healing in that. Your character Delana has a tumultuous relationship with her mom Jacqueline. Why? How does this tension shape your story? Delana, Jacqueline’s daughter, holds on to a great deal of hurt. Jacqueline has only been a Christian for a year, and prior to that, she often pushed her daughter aside, to excel in her career or for her latest boyfriend. There was one time in particular when Delana desperately needed her mother, and Jacqueline wasn’t there for her. So Delana doesn’t trust her. When Jacqueline reaches out to her, Delana’s always wondering, “For how long? When will you ditch me this time, Mom?” Add to this the fact that Delana’s not a Christian and doesn’t understand (or believe) Jacqueline’s life change. Therefore, Jacqueline needs to show her, through her actions, that she’s different—that she truly will stand by her daughter. No matter what. Isn’t that what every child, young or adult, needs to know? What role does Jacqueline’s faith in God play in the broken relationship between she and her daughter Delana? Oh, my, a big one! God is a God of reconciliation, unity, grace, and peace, and I believe He loves to see families find healing and restoration. As such, He gives Jacqueline the courage and perseverance to show consistent, steady love to her daughter, even when Delana spurns her efforts and acts downright hateful. But isn’t that what God’s done for each of us? While we were rebellious, selfish sinners, Christ died for us—to reconcile us to the Father. Jonathan Cohen is another one of your main characters. Share his story. Why is the role he plays important? I love Jonathan! Such a sweet, caring man! He lost his wife, the woman he adored, five years before the book started. Having found such a deep love already, he’s not sure he’ll ever find that in another woman. And yet, he’s lonely. To exacerbate matters, his sister believes he shouldn’t spend the rest of his life alone and embarks on a hilarious plan to help him get hitched! But after a few crazy blind dates, he’s more certain than ever that dating isn’t for him. Luckily Jacqueline steps in to save him just in time! What is your favorite scene in this story? Why? I don’t want to give too much away, but probably when Jonathan takes Jacqueline on a picnic and realizes, once they get there, that he doesn’t have eating utensils or anything for them to sit on. I loved this scene because I’ve always enjoyed picnics and this scene reminded me of a river walk area my honey and I used to visit in Louisiana. But I also felt this really revealed some of the things I love most about Jonathan. He really wants to be romantic but doesn’t always know how, so his efforts turn out a bit comical. And endearing. Adorable, actually. Where did you get the inspiration for your main characters? This is a fun question to answer because the inspiration came from individuals I greatly admire. Jonathan, a widowed railroader, was a lot of fun to create because my husband is a railroader. He’s worked for Union Pacific for almost 30 years, so yes, I did sprinkle a bit of my real life hero into Jonathan’s personality and encounters. As to Jacqueline, her character was inspired by a woman from our old church who at the age of 50, felt called to foster a teenage girl. This really struck me. I wondered if she originally felt intimidated. Not only was God calling her to a life-changing mission, but she was older, and single. Yet she answered the call with courage and perseverance, and a life was dramatically changed for the better because of it. As I was crafting Jacqueline, I wanted to take this a step further. I wondered, what if my character was not only older and single, but what if she was a new believer, one with deep regrets stemming from mistakes she made when parenting her child. Could God still use her, regrets and all, to bring hope to three orphan children? And thus, Jacqueline was born. What was the most challenging part of writing this book? And the most rewarding? This book was actually fairly easy to write. I visualized each character and their journeys so clearly. I simply transcribed what played out in my head. I also felt God’s presence so strongly throughout the writing process—I believe He guided me in each scene. In regard to the most rewarding, there’s a scene where Jacqueline “hears” from God (through a Scripture passage). The passage was so perfect for the scene and really a major theme of the book—breaking the bonds of generational poverty and abuse. I believe that passage came straight from God. I’d been praying about it. I wanted a verse that really spoke deeply to Jacqueline, but my brain was blank. So I turned to God in prayer then went to Scripture. I randomly flipped to the passage. Like immediately. I’m normally not a flip and point reader, but that’s what happened. It was a beautiful moment. There’s two things I hope readers will take away. One, God can bring incredible hope and healing from our worst storms, and two, when God calls, He guides and provides—courage, perseverance, strength. I hope readers will trust that God truly has their best in mind, and in trusting, that they follow His leading. Complete this sentence: My deepest hope for When Dawn Breaks is ______________________ because_____________________. My deepest hope for When Dawn Breaks is that it will draw readers closer to Christ and give them the courage to follow wholeheartedly after Him because that is where abundant life is found. Alexis: Thanks for the interview Jennifer! May God bless you in your writing endeavors! Do you have any final comments? Thanks for having me on your blog again! Before I leave, I’d like to ask your readers one question. I shared my favorite scene setting from the book, and it arose from a romantic place my hubby and I once frequented. Jennifer's question: Where is the most romantic place you’ve been? Tell us about it! As the hurricane forces Jacqueline to evacuate, her need for purpose and restitution motivate her to head north to her estranged and embittered daughter and into the arms of a handsome new friend. Dealing with his own issues, Jacqueline isn’t sure if he will be the one she can lean on during the difficult days ahead. And then there are the three orphans to consider, especially Gavin. Must she relinquish her chance at having love again in order to be restored?